Commuters read on the North Side, but count on the South Side. Confused? A street sign mobile catches the light at the Chicago History Museum. 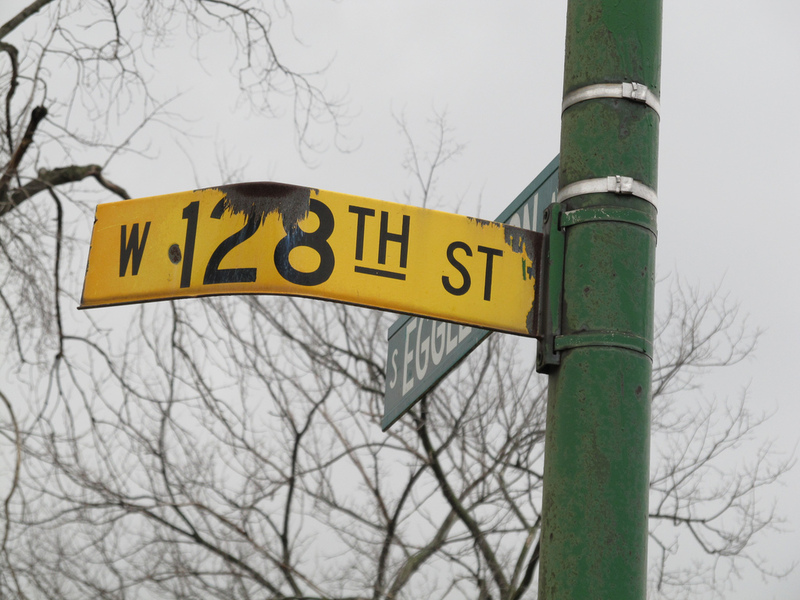 An old Chicago street sign in the historic Pullman neighborhood sticks around. Chicagoans love their grid. The organized structure of the streets makes it harder to get lost, eases our navigation of unfamiliar neighborhoods and imparts a tinge of pride in our well-organized city. As a Chicagoan, I’m a grid devotee; traveling without a car and counting on public transportation and cabs, I feel more confident getting around because of it. But even the beloved grid has its limits. Turns out, I’m not the only who sometimes gets confused. Loyal listener Mark Sheldon recently alerted us to the fact that North and South Side commuters have different experiences when driving and walking around the city. Mark asked a question that has stumped historians and lay people alike: why streets on the North Side are named but streets on the South Side are numbered. Mark first discovered this during his early days in Chicago, while he was commuting from Evanston to a teaching job in Gary, Ind. He looked around during his commute and realized he wasn’t memorizing names but counting numbers. So to figure out this change from North to South Side, who better to ask than the person who wrote the book on Chicago? Literally. Ann Durkin Keating is co-editor of Encyclopedia of Chicago and a history professor at North Central College in suburban Naperville. Our producers and reporters regard the tome (and in recent years, its online companion) as a go-to source when starting research on the nitty gritty of Chicago neighborhoods and politics. Admittedly, a part of me thought, “Sure, Keating will immediately know the answer.” Well, it’s not quite that simple. Keating says that efforts to systemize the city’s streets in the early part of the 20th Century changed street names to numbers on the South Side but, she admits, that’s just how it got systemized, not how it all began. Dr. Keating suggested that a South Sider might have a better perspective. Enter Columbia College history professor — and notorious White Sox fan — Dominic Pacyga. He says he’s thought about this question and even recalls hearing an answer at some point, but couldn’t remember where or when. His theory? South Siders are better at math than North Siders. All joking aside, Tom McNamee and the other historians I contacted think the answer is out there somewhere but we don’t have it quite yet. They have their theories, and have probably heard the reason at some point in their distinguished careers, but don’t know right now. We’ll cut them a break. This group has several books, publications and other academic pursuits under their belts, but they can’t be expected to know everything about the city every time we ask. Do you remember everything you learned in high school? Exactly. There is, however, someone who’s pretty hard to stump on Chicago history. Tim Samuelson is cultural historian for the city of Chicago. He has probably the most logical explanation so far. But, Mark and you are going to have to wait a little longer for that. What’s the fun in telling you now? There is still some navigating to do through the streets of old and new. So stay tuned, and remember to test your South Side friends on their math.